Venerable George was born in 1730 to pious Orthodox parents in Săliște Sibiu of Romania. From his youth he desired to pursue the monastic life. However, at that time the Roman Catholic Austrian rulers of Transylvania suppressed Orthodoxy, especially Orthodox monasticism, inclining the believers to union. Therefore, at the age of nineteen, the young man went to Wallachia and came to the Greek Metropolitan Rosca, who at that time was in Bucharest. He became the Saint's spiritual father. Shortly thereafter, in 1750, he went with his spiritual father to Constantinople, and then to Holy Mount Athos. Here he settled in the Vatopaidi Monastery, and was tonsured a monk and ordained as a deacon. After the death of his mentor, he became a disciple of Saint Paisius Velichkovsky in the Prophet Elias Skete. There, in 1752, he was tonsured into the Great Schema by the Saint Paisius, and in 1754 he was made a presbyter. 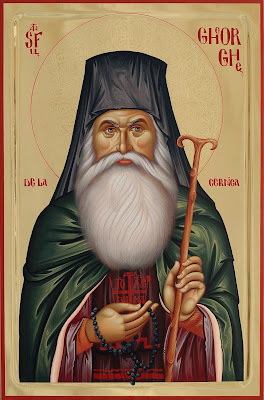 During his stay on Mount Athos with great zeal and great spiritual benefit, he advanced along the ladder of spiritual perfection, comprehending the joy of living in Christ. In 1763, together with sixty-four other disciples, he followed Saint Paisius to Moldavia, to the Dragomirna Monastery. For the next twelve years, he served in this monastery as a hieromonk, confessor and steward. After Bukovina fell under the power of Roman Catholic Austria, in 1775, the Dragomirna brethren, led by the elder Paisius, moved to the Sokolski Monastery. In 1779, he followed Saint Paisius to the Nyametsky Monastery, where he lived for another two years. In 1781, wanting to refresh the memory of his disciples, with the blessing of his Elder he again went to Mount Athos. Arriving in Bucharest, he was stopped here by the Metropolitan of Hungaro-Wallachia Gregory II and his old friend, a disciple of Saint Paisius, and Hieromonk Makarios. After their persistent persuasion, which was followed by prayer and fasting and a vision of Saint Nicholas, he agreed to take on the revival of monastic life in the Cernica Monastery, which was dedicated to Saint Nicholas, and which was in ruins for more than thirty years. His task was to arrange a monastery in this region of Wallachia with a communal charter, similar to the Athonite and Paisiev monasteries. With the help of the Wallachian ruler Nicholas Mavrogenes and other Christians, Father George began to restore the main church and cells. He devoted a lot of time to perfecting the spiritual life of the monastics. In the monastery the services was performed every day, along with reading the Holy Scriptures and the works of the Holy Fathers of the Church, and the work carried out in numerous obediences, they were engaged in the manuscript copying and physical labor. With his sacrificial and gifted shepherding, he again lit a hotbed of spiritual life in the Cernica Monastery and in just five years gathered a community of 103 inhabitants. In 1785, Saint George was seriously ill and, awaiting an imminent demise, made his testament, in which he prescribed the proper order of life of the monastic community. However, he soon recovered and continued his pastoral feat. In view of his successes, in 1793, Metropolitan Hungaro-Wallachia Philaret II also entrusted him to the Caldarusani Monastery. From April 1794, Father George lived in both monasteries alternately, appointing in them also abbots, especially during his absence. In both monasteries he introduced the Athonite-Paisiev communal charter, which included seven times daily worship, frequent confession, obedience, constant prayer, and a common meal. Saint George continued to manage both monasteries until the very end of his earthly life. He died on December 3, 1806, lamented by the numerous brethren of the two monasteries. He was buried in the Cernica Monastery, in front of the Church of Saint Lazarus. After the death of Saint George he earned veneration as a pastor of high spiritual life, the leader of the two great monastic centers of Wallachia, a renewer of the true monastic life of the Athos and Paisiev hesychast tradition. The elder had many disciples and followers, such as Saint Kallinikos of Cernica, the Hieromonk Makarios and others. At the meeting of the Holy Synod of the Romanian Orthodox Church on October 20-21, 2005, Elder George was glorified and listed among the saints. The ceremonial announcement of canonization took place on the day of his memory, December 3, of the same year, in the Cernica Monastery. The rite of glorification was headed by Patriarch Theoktist of Romanian. By the decision of the Holy Synod of the Russian Orthodox Church of August 21, 2007, the name of the monk was included in the synaxarion of the Russian Church.